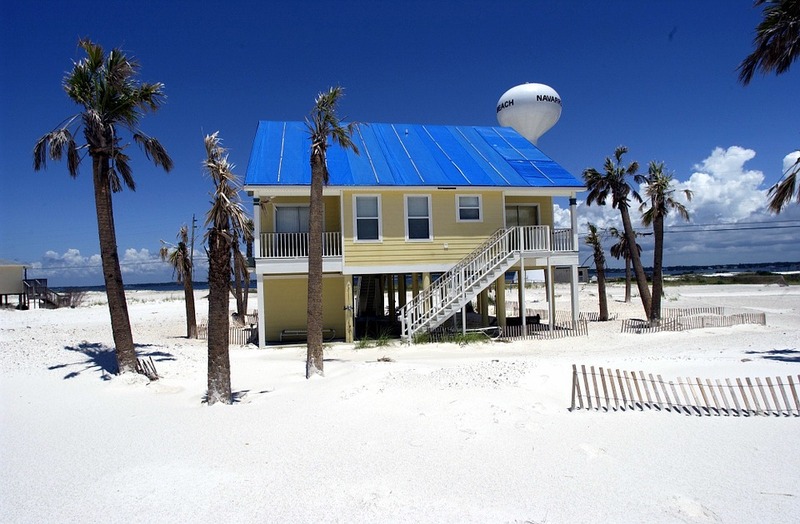 From 2011 through 2015, approximately 2.4% of the population moved from one state to another. Despite the image of retirees as being footloose, retirees were less likely to move to another state. Only 1.3% of retirees (who make up 21.1% of the population) moved to another state during this period. Cost of living, average winter temperatures and state employment growth appear to be the strongest factors determining which states retirees move to. Employment growth plays a role as many retirees continue to work in retirement and/or may follow children who have moved to states with high employment growth. Cost of living is important because retirees who move only have modestly higher average incomes than those that don’t move. They are not wealthy, so cost of living is meaningful for them. Wealthy retirees’ move destinations do not show a strong correlation with cost of living. Some states appear to receive higher retiree migration than would be expected based on their cost of living, winter temperatures and employment growth. This may be explained by their reputation as a retirement destination. Retiree migration is also probably somewhat self-perpetuating as retirees follow friends and relatives. 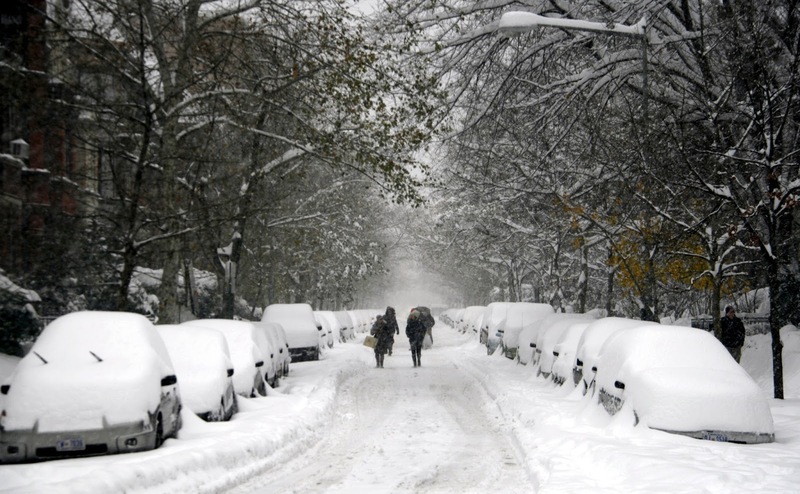 States with high costs of living and colder winters are also often high tax states. While taxes do not appear to be a primary driver of retiree migration, the loss or gain of income due to net retiree migration can be material relative to the difference between state revenues and expenses. This discussion is based on analyzing data from the US Census data made available by the University of Minnesota through IPUMS-USA. The subset of data I used was persons who had income (INCTOT is not NA) in years 2011 through 2015. I defined retirees as those who had some retirement income (INCRETIR>0), or those older than 50 who had Social Security income. I only looked at state to state moves (I did not look at people moving to a state from another country). Net retiree migration is defined as retirees moving in minus retirees moving out divided by total retirees in the state. Table 1 shows key characteristics of the seven states who received the most net retirees from other states, and the seven states who lost the most net retirees. The profile of retirees that move out of state is very similar to the profile of retirees that don't move. The median age of retirees who move is only 2 years younger (68) than the median age of all retirees (70). What Determines Where Retirees Move? One of the factors that appears to drive retirees to move is cost of living. Figure 1 shows the relationship between cost of living and net retiree migration. Cost of living explains about 20% of the variation in net retiree migration. Retirees that move (see both incoming and outgoing columns in Table 2) have average incomes that are generally equal to or only modestly above the average income of all retirees. Thus they are not wealthy, so the cost of living is meaningful for them. As discussed below, cost of living is not an important factor attracting the wealthiest 5% of retirees. Average winter temperature is another factor that appears to be attracting the average retiree to move. 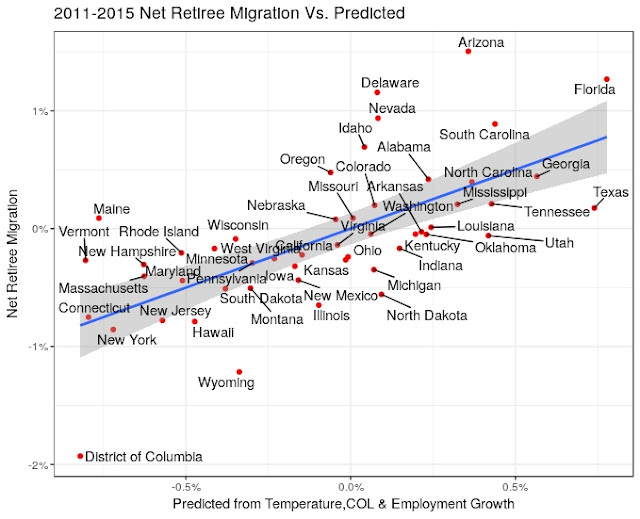 Figure 2 shows the relationship between net retiree migration and average winter temperature. 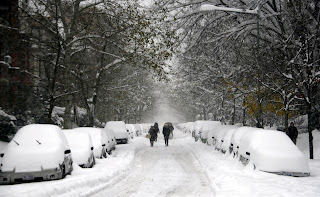 Winter temperature on it’s own explains about 12% of the variation in net retiree migration. While it may seem surprising, state employment growth also appears to draw retirees. Figure 3 shows net retiree migration versus employment growth. 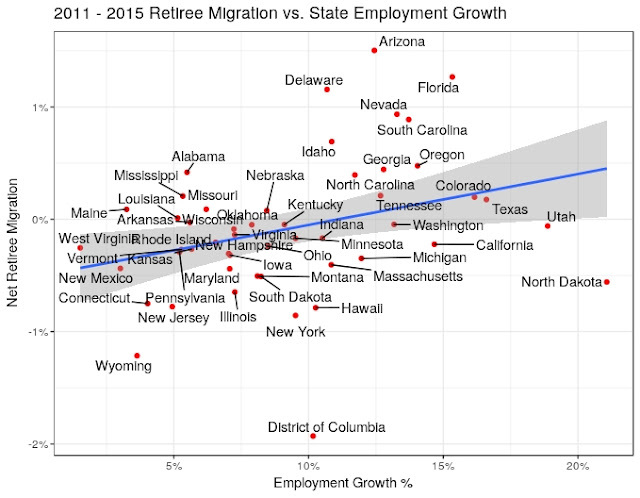 State employment growth explains about 11% of the variation in net retiree migration. Employment growth plays a role as many retirees continue to work in retirement and/or may follow children who have moved to states with high employment growth. Figure 4 illustrates predicted migration based on cost of living, winter temperature and employment growth. On a combined basis, these three factors explain 45% of the variation in net retiree migration. While cost of living is highly correlated with state tax burdens as shown in Figure 5, tax burdens themselves do not improve the prediction of net retiree migration (the presence or absence of death taxes by state also did not improve prediction). If one looks at the wealthiest 5% of retirees (total annual income > $104,000/person), state employment growth continues to help explain their migration pattern by state. However, Figure 6 shows there is no strong relationship between cost of living and the pattern of net retiree migration for wealthy retirees (cost of living only explains 2.7% of variation and is not statistically significant). That is also true for average winter temperature and tax burden. Presumably the wealthiest retirees have easy access to warm weather and are not as concerned as the average retiree is with the cost of living (or paying taxes). Certain states appear to “do better” in attracting retirees than would be expected based solely on cost of living and winter temperatures. In the upper right of Figure 3, Florida (and Arizona) fall well above the predicted level of retiree migration, while Louisiana (for example) falls below. Both have similar cost of living and temperate Winters. Figure 7 indicates that Florida has a stronger “market presence” than Louisiana when it comes to thinking about a place to retire. Tables 2 and 3 show where retirees come from who move to Florida and Louisiana respectively. 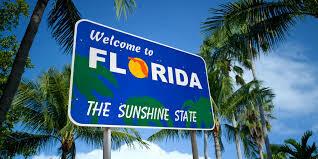 Florida has a more diversified source of retirees than Louisiana. Florida draws from relatively distant areas in the Midwest and Northeast, as well as nearby southern states. For Louisiana, on the other hand, Texas is the dominant source of retirees and a significant portion of Louisiana’s other sources are also southern states. Retiree flows are also probably somewhat self-perpetuating as retirees move where there friends and/or family have moved. While taxes do not appear to be the primary driver of retiree migration, the net income gains from retiree migrations may be material relative to state operating net income. We can roughly estimate the income gained or lost by summing the income of incoming retirees minus the income of outgoing retirees. Table 4 highlights these estimated flows. The net of retirees moving from Illinois, for example, had income of $732 million/year (5th column of Table 4). That amount is significant relative to Illinois state revenues minus expenses. It is difficult to quantify the exact impact on Illinois state finances, however, as only a portion of that income would have been remitted in state taxes. However a significant portion of that income would also have been spent in Illinois, generating additional sales and income tax revenue from local businesses. Table 4 shows average annual net retiree income gained or lost in order to compare with annual state revenues minus expenses, but note that the cumulative income lost from 2011 to 2015 was 5 times this annualized amount. Thus the cumulative impact of net retiree income gained or lost could be meaningful as a headwind or as a tailwind for states as they work to balance their budgets. Note also that states that are losing net retirees tend to have higher levels of unfunded pension debt. State that are losing retirees cannot do much to reverse the adverse effects of their cost of living or winter temperatures. However, they can attempt to compete for retiree (and non-retiree) migration by encouraging job growth within their state. Transparent and reproducible: All of the labeled Figures and Tables can be generated using the free, publicly-available R program and the R code available in “RetireeMigration.r” on github to analyze the publicly available data obtainable from the links in the article. Alaska is omitted from the data used to estimate relationships affecting net retiree migration as Alaska has unique income characteristics. It explains 12% of the variation in their net migration by state.